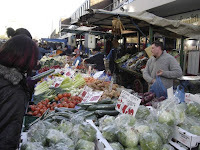 The plan was to get up early and venture to Church Street Market off Edgeware Road. But, after I couldn't sleep, again, I didn't rise until 11 a.m. I left at around noon and made my way to the Bayswater tube station. On the way traffic was backed up a trifling amount for no particular reason. I hopped on the tube at Bayswater and took the District line to Edgeware Road. Walking along the streets the past couple days have yielded anger and hostility to the people of this town. Who in their right mind would ever make streets in a town that are so windy and confusing? And then I remember that this city is close to 1000 years old in parts and the idea of blocks and four way stops is an invention of the 18th century, by none other than Thomas Jefferson. I made it to the market in good time. Another thing that the market reflected, which I have failed to note this week is the range of cultures in every setting I've seen so far in this city. Strolling through the vegetable, fish, leather, purse, dry good, and flower vendors you see many different people with many different stories and perspectives. I walked from one end to the other purchasing only a 99p bottle of dish soap. Hopping on a train at Edgeware on the Bakerloo line, I marveled at the difference in all the stations I have seen so far. And, I've been here less than 4 days. I took the Bakerloo to Oxford Circus and changed trains to get on the Central Line to Bank before transferring yet again to the North line, south to London Bridge. 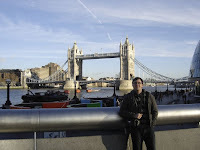 I took a wrong turn, with thoughts in mind of seeing London Bridge first, and headed toward the Tower Bridge. From the view by the Scoop, an architecturally modern building, you could see the Tower Bridge, Tower of London and Swiss Re Tower. 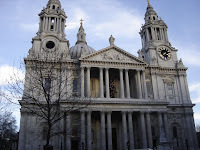 I walked along the Thames, to London Bridge and then ventured around seeing the only remains of the original London Bridge in the courtyard of St. Magnus-the-Martyr Church, and then journeying over to see St. Paul's Cathedral. I came back here, after stopping at Tesco, an obvious challenge every time I go. I did buy spaghetti, two cans of tomato sauce, rice, potatoes, and 3 banana's for £6.60. Tonight, we plan on going to a pub in Notting Hill for a class assignment, yes pub crawling for school, isn't it great. Actually, on Tues. we were assigned each a Football (soccer) club to become a fan of because of its popularity in British culture. The assignment is to go to a pub, where natives can be found and strike up a conversation involving my team, Sunderland A.F.C. To say that Londoners, and all British are just casual fans of one team is to say that I don't care a thing about eating and sleeping. They take it very seriously and I'm either going to get lucky when talking about Sunderland, or unlikely, which might be more interesting. I'll be sure to let you know how it goes.